IAAI - Ia Kutateladze is a product and jewelry designer born in Tbilisi, Georgia. She studied product and interior design in Florence, Italy, graduating in 2010. 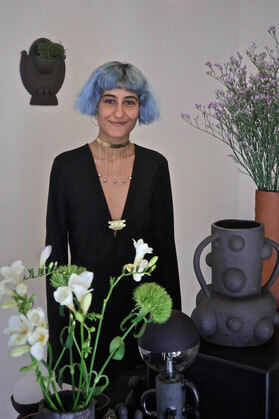 Since her return to Tbilisi, she has been creating various products, from lighting to furniture and other living accessories. In 2016, after moving to Berlin, she started the jewelry design line, inspired by simplicity, playfulness and curiosity. Recently, the exploration and the fascination with ceramics began, which is an ongoing creative and educational process for her. "To me, design is a palette of boundless imagination, intuitive approach, aesthetic sense and adventurousness expressed through forms. Design excellently transforms everyday life into joyful process of invention. My designs are playful objects of affection, which are results of slight and uncomplicated impressions, observations or interpretations.Sheer simplicity and attention to details, integrated with profound understanding of the surroundings, the past and the future, are at the core of my designs.I would like my designs to be more than functional objects, to have the power to magically interact with people."